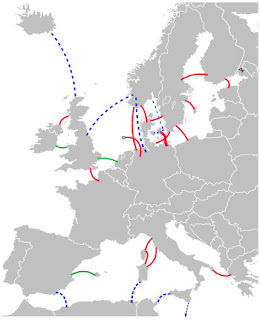 HVDC Interconnections in Western Europe - red are existing links, green are under construction, and blue are proposed. Many of these transfer power from renewable sources such as hydro and wind. Alternating current is a wave of electrons flowing back and forth through a wire. The properties of AC current allow the voltage to be stepped up dramatically higher by transformers, and the higher the voltage, the less electric power is lost in transmission. Thomas Edison's original DC systems, launched in 1882, lacked the means to transform voltage t and so were limited by the size of the copper wire that carried the current. That forced him into a strategy of many small generators serving sections of cities. It is said "Edison had to build a plant for every five blocks." High voltages cannot be easily used in lighting and motors, and so transmission-level voltage must be reduced to values compatible with end-use equipment. The transformer, which only works with alternating current, is an efficient way to change voltages. The competition between the DC of Thomas Edison and the AC of Nikola Tesla and George Westinghouse was known as the War of Currents, with AC emerging victorious. By the early 1900s, AC dominated the scene, opening the way to ever larger generators, longer transmission lines and the monopolization of much of the industry. The development of high power electronic devices such as mercury arc valves and later semiconductor devices, such as thyristors to regulate voltage put DC back in the picture. Today, banks of electronic switches are used to step up direct current for transmission, then bring it down at the end of the line. With that issue solved, DC's advantages versus AC become important in certain applications. DC lines connect grids and transmit power from one point to another. Since the remainder of the power system uses AC, DC systems require a converter to convert (rectify) power from AC to DC as it goes into the DC power line and to reconvert (invert) it from DC to AC as it reenters the AC system. High voltage is used for transmission to reduce the energy lost in the resistance of the wires. For a given quantity of power transmitted, higher voltage reduces the transmission power loss. Power in a circuit is proportional to the current, but the power lost as heat in the wires is proportional to the square of the current. However, power is also proportional to voltage, so for a given power level, higher voltage can be traded off for lower current. Thus, the higher the voltage, the lower the power loss. Power loss can also be reduced by reducing resistance, commonly achieved by increasing the diameter of the conductor; but larger conductors are heavier and more expensive. AC - Alternating Current - the movement of electric charge periodically reverses direction. AC is the form in which electric power is delivered to businesses and residences. The usual waveform of an AC power circuit is a sine wave. Bulk Transmission - A function or voltage classification relating to the higher voltage portion of the transmission system, specifically, lines at or above a voltage level of 115 kV. DC - Direct Current - the unidirectional flow of electric charge. Direct current is produced by such sources as batteries, thermocouples, solar cells, and commutator-type electric machines of the dynamo type. Dielectric - An electrical insulator that can be polarized by an applied electric field. When a dielectric is placed in an electric field, electric charges do not flow through the material, as in a conductor, but only slightly shift from their average equilibrium positions causing dielectric polarization. Because of dielectric polarization, positive charges are displaced toward the field and negative charges shift in the opposite direction. This creates an internal electric field which reduces the overall field within the dielectric itself. "Dielectric" is typically used to describe materials with a high polarizability. while "insulator" is more often used when the material is being used to prevent a current flow across it. GTO – Gate Turn-Off Thyristor - a special type of thyristor, a high-power semiconductor device. GTOs, as opposed to normal thyristors, are fully controllable switches which can be turned on and off by their third lead, the GATE lead. Normal thyristors can only be turned ON and cannot be turned OFF. Thyristors are switched on by a gate signal, but even after the gate signal is de-asserted (removed), the thyristor remains in the On-state until any turn-off condition occurs (which can be the application of a reverse voltage to the terminals, or when the current flowing through (forward current) falls below a certain threshold value known as the "holding current"). Thus, a thyristor behaves like a normal semiconductor diode after it is turned on or "fired". HTS - High Temp Superconductor wire - Able to carry tremendous amounts of current with no losses (except for a small loss for the cooling systems). The ability to carry higher current values allows you avoid the costs of higher voltages. “High Temperature” is a relative term - 77K liquid nitrogen use temperature is “high” compared to the 5K liquid hydrogen used for conventional “Low Temperature” superconductors. 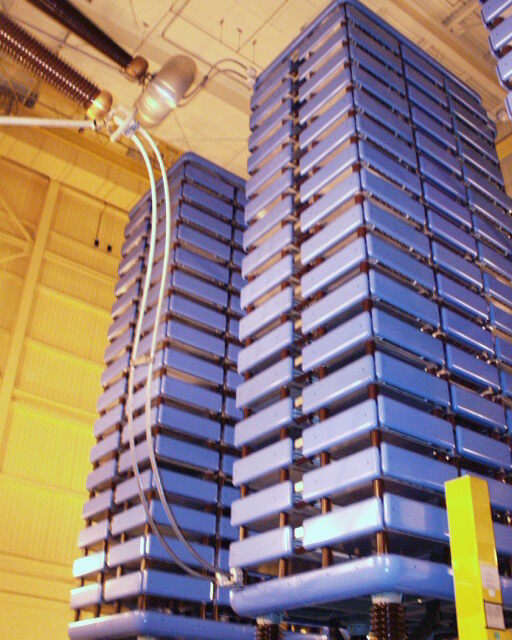 In July 2010, Nexans, a leader in the cable industry, successfully completed a test of the world’s first HVDC high temperature superconductor (HTS) power transmission cable designed for 200 kV. IGBT - Insulated-gate bipolar transistors - A three-terminal power semiconductor device, noted for high efficiency and fast switching. It switches electric power in many modern appliances: electric cars, variable speed refrigerators, air-conditioners, and even stereo systems with switching amplifiers. Helps to make smaller HVDC systems economical. These may be installed in existing AC grids for their role in stabilizing power flow without the additional short-circuit current that would be produced by an additional AC transmission line. Mercury Arc Valve - Type of electrical rectifier which converts alternating current into direct current. Rectifiers of this type were used in electric motor power supplies for industry, in electric railways, streetcars and electric locomotives. They also found use in static inverter stations and as rectifiers for high-voltage direct current power transmission. Mercury arc rectifiers were invented by Peter Cooper Hewitt in 1902 and further developed throughout the 1920s and 1930s by researchers in both Europe and North America. Before the advent of solid-state devices, mercury arc rectifiers were one of the more efficient rectifiers. By 1975, high-voltage solid state devices such as the silicon diode and thyristor made the mercury arc rectifier obsolete even in high-voltage DC applications. With two exceptions, all former mercury rectifiers worldwide have been dismantled or replaced by thyristor units. Power MOSFET - A specific type of Metal Oxide Semiconductor Field-Effect Transistor (MOSFET) designed to handle large amounts of power. Compared to the other power semiconductor devices (IGBT, Thyristor...), its main advantages are high commutation speed and good efficiency at low voltages. It shares with the IGBT an isolated gate that makes it easy to drive. Resistance – The characteristic of materials to restrict the flow of current in an electric circuit. Resistance is inherent in any electric wire, including those used for the transmission of electric power. Resistance in the wire is responsible for heating the wire as current flows through it and the subsequent power loss due to that heating. Tie-line – The physical connection (e.g. transmission lines, transformers, switch gear) between two electric systems that permits the transfer of electric energy in one or both directions. Underground Power Lines -Useful in cities and in areas where views and vistas have significant social value. Air cools overhead electric lines, but engineers have had to find other ways to cool underground lines. They typically use an oil system that employs pumps to circulate the oil. Because these cooling systems are expensive and because it is costly to dig trenches for the lines, it is more expensive to bury power lines underground than to string them above ground. Although underground lines are away from weather, vegetation and vehicles, they also are more difficult to access, it is more difficult to pinpoint the location of a fault, and their cooling systems can fail. Voltage Drop - The reduction in voltage in the passive elements (not containing sources) of an electrical circuit. Voltage drops across conductors, contacts, connectors and source internal resistances are undesired as they reduce the supplied voltage. Power lines carry electricity over long distances, but the electrical energy gradually dissipates into the air in the form of heat. In addition, much as water flowing through a pipe gradually loses pressure, electricity gradually drops in voltage when it is transmitted over long distances. Voltage drops can be cured by devices called capacitors, but at a cost of more energy lost. The United States as a whole loses nearly 10 percent of all the power it generates to these technical limitations. So, although it is technically possible to generate power in the Dakotas with wind turbines to supply the large parts of the nation’s electrical needs, it is not practicable to deliver that power over such a long distance using the existing AC transmission system. VSC - Voltage Source Converter - (Thank you to Peter Vaessen for this definition. VSC HVDC is based upon transistor technology and was developed in the 1990′s. The switching element is the Insulated Gate Bipolar Thyristor (IGBT), which can be switched on and off by applying a suitable voltage to the gate (steering electrode). Because of the more switching operations, and the nature of the semiconductor devices itself, the converter losses are generally higher than those of HVDC classic converters. VSC HVDC is commonly used with underground or submarine cables with a transfer capacity in the range of 10 – 1000 MW, and is suitable to serve as a connection to a wind farm or supply a remote load. VSC HVDC technology has very fast steer and control functionality and is suitable for meshed networks. It is characterised by compactness of the converter stations, due to the reduced need for AC harmonic filters and reactive power compensation. Power flow reversal in VSC systems is achieved by reversal of the current, whereas in HVDC classic systems the voltage polarity has to change. An important consequence of this voltage source behavior is the ability to use cheaper and easier to install XLPE cables, instead of the mass-impregnated cables that are needed for HVDC classic. 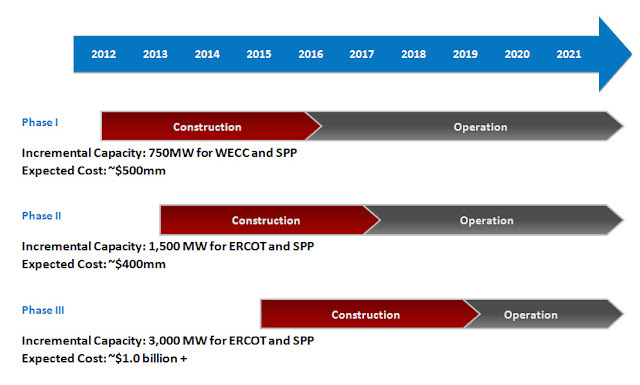 Currently, only twelve VSC HVDC projects are in service. A few examples include: Estlink, which connects Estonia to Finland (350 MW), and BorWin1, connecting an offshore wind farm to Northern Germany (400 MW). Both are equipped with ±150 kV submarine cables, and the Trans Bay project in California (400 MW) that consists of 90 km ±200 kV submarine cable. Most projects have submarine cable, but some projects include long lengths of underground cable, such as Murraylink (220 MW, 177 km underground cable), and Nord E.On 1 (400 MW, 75km underground cable). The 500 MW East-West interconnector between Ireland and Great Britain, operating at ±200 kV, is scheduled to go into service in 2012. A 2000 MW 65 km cable interconnector ±320kV as part of the Trans European Network—between Spain and France—is scheduled for commissioning in 2013, and will represent the highest power rating for a VSC HVDC system installed at this time. Despite its cost, HVDC lines can cost-effectively connect low-cost power plants to higher cost regions of the country. A HVDC line might carry 1,000 MW to 3,000 MW. For example, wind and coal resources in the Great Plains could be shipped via HVDC lines to load centers to the east or west. HVDC lines now connect low-cost hydroelectric resources in northern Canada to U.S. markets. HVDC has the ability to transmit large amounts of power over long distances with lower capital costs and with lower losses than AC. Depending on voltage level and construction details, losses are quoted as about 3% per 1,000 km. High-voltage direct current transmission allows efficient use of energy sources remote from load centers. Examples of DC systems used to connect power grids include the DC lines that allow power to flow from the Western Interconnection to the Eastern Interconnection. The AC/DC/AC connection acts like an air lock between two systems that have no AC connections—power flows can be controlled precisely between the systems up to the limits of the converter station. DC has not been used to deliver power to customers because of the cost of the AC/DC converters. A converter station costs in the range of $50 million, and a DC line requires a converter station at each end to connect to the AC grid. This is far more expensive than the transformers that step AC transmission voltages down to typical voltages that consumers use. In Rihand-Delhi Project in India, HVDC was chosen to transmit bulk (thermal) power (1500 MW) to Delhi, to ensure: minimum losses, least amount right-of-way, and better stability and control. In Garabi, an independent transmission project (ITP) transferring power from Argentina to Brazil, HVDC back-to-back system was chosen to ensure supply of 50 Hz bulk (1000MW) power to a 60 Hz system under a 20-year power supply contract. In Gotland, Sweden, HVDC was chosen to connect a newly developed wind power site to the main city of Visby, in consideration of the environmental sensitivity of the project area (an archaeological and tourist area) and improve power quality. In Queensland, Australia, HVDC was chosen in an ITP to interconnect two independent grids (of New South Wales and Queensland) to: enable electricity trading between the two systems (including change of direction of power flow); ensure very low environmental impact and reduce construction time. Greater Capacity- HVDC can carry more power per conductor, because for a given power rating the constant voltage in a DC line is lower than the peak voltage in an AC line. DC does not have the 1.4 factor for the peaks that go with sine waves, so there is that advantage regarding the working voltage versus the peak voltage allowable. In AC power, the root mean square (RMS) voltage measurement is considered the standard, but RMS is only about 71% of the peak voltage. The peak voltage of AC determines the actual insulation thickness and conductor spacing. Because DC operates at a constant maximum voltage without RMS, this allows existing transmission line corridors with equally sized conductors and insulation to carry 29% more power into an area of high power consumption than AC, which can lower costs. Easier Interconnection - AC transmission lines can only interconnect synchronized AC networks that oscillate at the same frequency and in phase. Many areas that wish to share power have unsynchronized networks. The power grids of the UK, Northern Europe and continental Europe are not united into a single synchronized network. Japan has 50 Hz and 60 Hz networks. Continental North America, while operating at 60 Hz throughout, is divided into regions which are unsynchronized: East, West, Texas, Quebec, and Alaska. Brazil and Paraguay, which share the enormous Itapúa hydroelectric plant, operate on 60 Hz and 50 Hz respectively. However, HVDC systems make it possible to interconnect unsynchronized AC networks, and also add the possibility of controlling AC voltage and reactive power flow. A generator connected to a long AC transmission line may become unstable and fall out of synchronization with a distant AC power system. 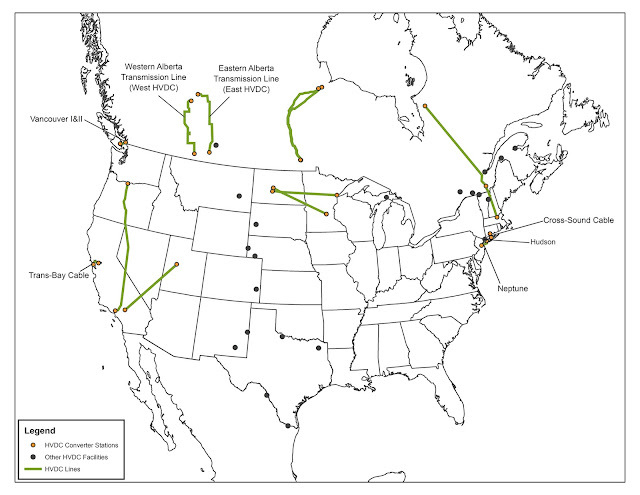 An HVDC transmission link may make it economically feasible to use remote generation sites. TresAmigas, has an ambitious plan to link America’s three vast interconnections –- east, west, and Texas –- via a 5-gigawatt, HVDC power line installed at a superstation just outside of Clovis, New Mexico. System Reliability - Because HVDC allows power transmission between unsynchronized AC distribution systems, it can help increase system stability, by preventing cascading failures from propagating from one part of a wider power transmission grid to another. Changes in load that would cause portions of an AC network to become unsynchronized and separate would not similarly affect a DC link, and the power flow through the DC link would tend to stabilize the AC network. The magnitude and direction of power flow through a DC link can be directly commanded, and changed as needed to support the AC networks at either end of the DC link. Less Interference - DC lines, have a lot less interference in them which makes it easier to run them in existing right of ways such as a railroad corridor. DC lines don’t present any of the electromagnetic field concerns that often cause concern for abutters and the towers can be built smaller. Improved Air Quality - HVDC transmission lines, by contrast with HVAC lines, produce hardly any electro smog. Control - Pepco Holdings Inc. in Washington, D.C., chose direct current for a major part of a proposed line that would run from northern Virginia under the Chesapeake Bay and into the Delmarva Peninsula. The lower part of the Delmarva peninsula is a kind of cul-de-sac for electricity flow. Adding a new AC line into the area might not alleviate power shortages in the rural southern area because of the difficulty in controlling where the more willful AC current flows. Once the line was connected to the existing grid, the greater demand for power to the north could shift flows in that direction, leaving the southern part still short of power. Using DC permits Pepco to channel power precisely to the point in the AC grid where it is most needed. Cost - HVDC lines can can carry more power over long distances than a comparable AC link. According to ABB, a 2,000-kilometer-long HVDC line rated at 80 kilovolts loses about 5 percent of the electricity it carries to hear, while an equivalent AC line would lose about 10 percent. Conversion - The required static inverters are expensive and have limited overload capacity. At smaller transmission distances the losses in the static inverters may be bigger than in an AC transmission line. The cost of the inverters may not be offset by reductions in line construction cost and lower line loss. Switching - In contrast to AC systems, realizing multi-terminal systems is complex, as is expanding existing schemes to multi-terminal systems. High voltage DC circuit breakers are difficult to build because some mechanism must be included in the circuit breaker to force current to zero, otherwise arcing and contact wear would be too great to allow reliable switching. Multi-terminal lines are rare. Control - Controlling power flow in a multi-terminal DC system requires good communication between all the terminals; power flow must be actively regulated by the control system instead of by the inherent properties of the transmission line. are less standardized than AC systems and the used technology changes fast. 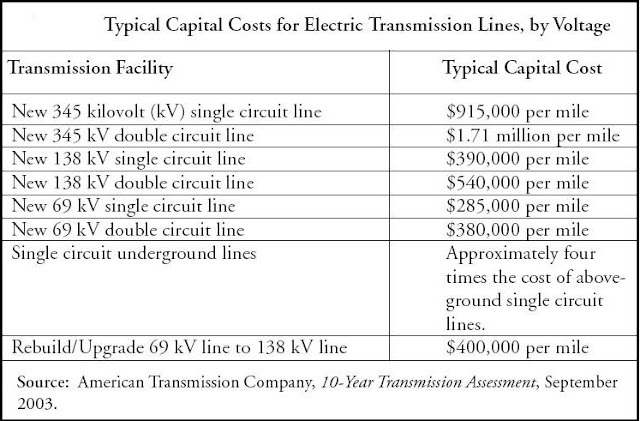 Lack of Local Benefit - DC lines have no benefit for those it passes because the facility is at one end of the line and the power is going to the other with a huge tower, high voltage lines and no real benefit accruing to those who live along/under the lines. The DC construction would amount an “extension cord,” and makes it clear to transmission project abutters that their burden is explicitly to someone’s else’s benefit. 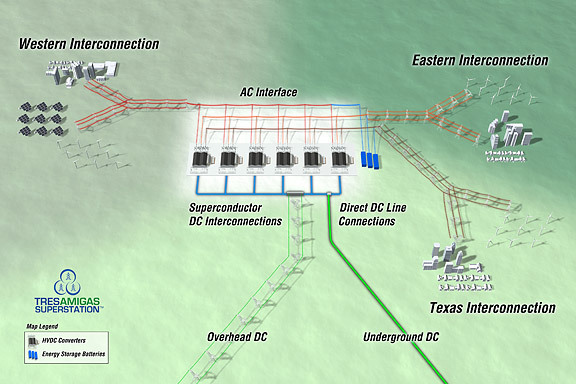 The Tres Amigas SuperStation focuses on uniting North America’s two major power grids (the Eastern Interconnection and the Western Interconnection) and one minor grid (the Texas Interconnection) to enable faster adoption of renewable energy and increase the reliability of the U.S. grid. 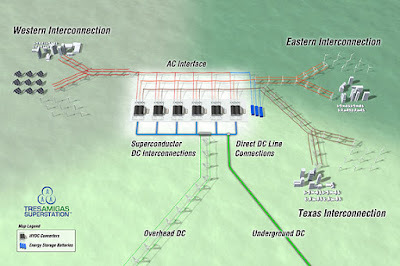 The Tres Amigas SuperStation will tie the grids together via three 5 GW superconductive high-voltage direct current power transmission lines, which permit a controlled flow of energy while also functionally isolating the independent AC frequencies of each side. The design is scalable to 30 GW. Tres Amigas uses high-temperature superconductor (HTS) wire. The Tres Amigas super station will be located on a 22-square-mile plot of land near Clovis, New Mexico. Early estimates of the cost put the project budget at around $600 million. In April 2011, Alstom Grid won the contract, worth at least 150 million Euros, to deliver the High Voltage Direct Current (HVDC) converter to the Tres Amigas Superstation. The 750 megawatt/345 kilovolt converter will play at central role at Tres Amigas. The Tres Amigas SuperStation will act as a power market hub, enabling the buying and selling of electricity among three of North America's largest interconnections, which is not possible today. Construction, overseen by CH2M Hill begins in 2012 and ideally it will become operational in 2014. In March, 2010, Tres Amigas obtained all of the necessary FERC approvals to sell transmission service at negotiated, or market-based, rates. FERC approvals apply to all phases of the development plan. Occidental has appealed the FERC approval in DC Circuit court, but should be resolved shortly. FERC declined to disclaim jurisdiction over prospective transmission facilities to interconnect Tres Amigas and the Electric Reliability Council of Texas ("ERCOT"), stating it did not have the information necessary to grant the request. The Commission went on to state that upon receipt of a valid application (210/211 process), the Commission could issue orders to allow Tres Amigas to proceed and interconnect with ERCOT without conferring FERC jurisdiction over ERCOT utilities. October 2016 marked seven years since the Tres Amigas company first announced its plan to create an electrical superstation connecting three U.S. power grids, with Clovis at the center. That superstation still has a ways to go, but is "alive and well," according to Tres Amigas Chief Financial Officer Russell Stidolph. Although the company three years ago announced a 2016 completion date, Stidolph now expects the finished project to emerge in another three to five years. Western Interconnect LLC ("WI") launched on October 3, 2016, an Open Season process to allocate up to 603 MW of transmission rights on its proposed transmission line in New Mexico. Through this Open Season, WI will solicit Transmission Service Requests ("TSR") from parties willing to acquire firm transmission service rights at the same rates, terms and conditions as offered to anchor customers on the line. The TSR submission window will conclude on November 11, 2016. ABB - Won an approximately $1 billion order from Dutch-German transmission grid operator TenneT to build the world’s largest offshore HVDC (high-voltage direct current) system. The system, planned to go operational in 2015, will connect Germany’s offshore North Sea wind farms to its mainland grid. Germany intends to double its present 27 gigawatts of wind capacity -- eight percent of its electricity requirements -- by 2020. Much of the new capacity will have to be offshore because so many of the available land sites have been used. The 400-megawatt Gode Wind II wind farm is the third German offshore project that ABB has been tapped to connect to the grid. The company will design, engineer, supply and install a 900-megawatt-carrying-capacity HVDC land and sea cable system, the offshore platform, and the offshore and onshore converter stations. The highly efficient 320-kilovolt HVDC lines, which limit electrical losses to less than 1 percent per converter station, will take the power generated at Gode Wind II and other wind farms to an offshore HVDC converter station. From there, the electricity will be transferred via 135 kilometers of underwater and underground cables to an onshore HVDC station at Dörpen on the German coast, and from there will travel to the mainland grid. American Transmission Company - Waukesha, WI - One example of HVDC in action is in Michigan’s Upper Peninsula. The American Transmission Company, which supplies power to the region, is using HVDC light technology to help control power flow, enhance grid stability, and allow for the integration and efficient use of additional renewable energy sources to compensate for traditional generation plants that are being retired or reducing output. This system provides a buffer that can slow down and redirect large amounts of electrical power so the regional network isn‘t overwhelmed. Moreover, during maintenance or other stoppages of one converter, the other is designed to run as a STATCOM, continuing to provide dynamic voltage support to the network. Tres Amigas LLC - Santa Fe, New Mexico, moving HQ to downtown Albuquerque - See Discussion in 6. Next Steps above. The management team is negotiating leases on two buildings now and will announce their locations in the next few weeks. Remodeling those facilities and installing command-and-control equipment would be part of phase-one construction to get the centers up and running before the first phase of Tres Amigas comes online. Apart from managing the Superstation, the control centers would oversee the buying and selling of electricity between power generators and utilities, converting New Mexico into a national hub for clean electricity trading, much like a stock exchange for electric markets. Financial firms and brokers could establish operations nearby to manage trade deals, similar to the Chicago Mercantile Exchange. Transmission lines are important part of power network and are also loosely called as power lines. It should be remembered that the term power line also includes distribution line.